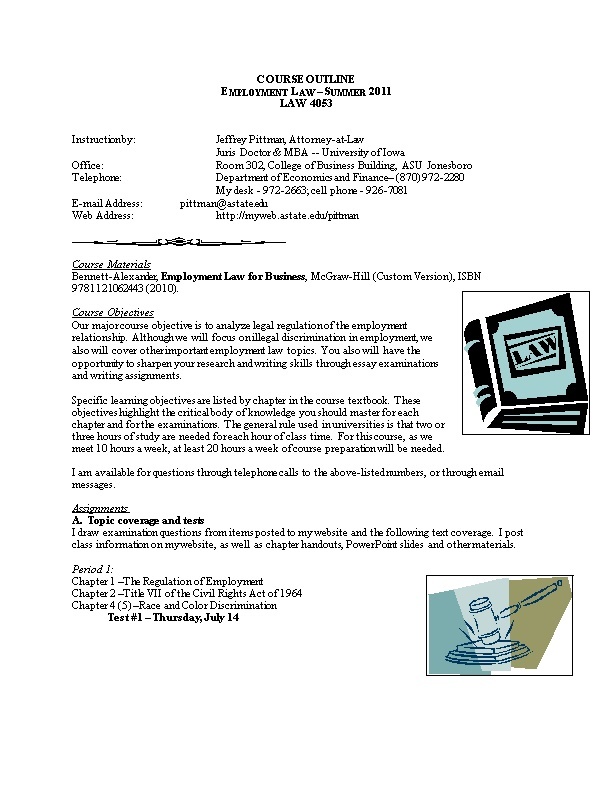 Bennett-Alexander, Employment Law for Business, McGraw-Hill (Custom Version),ISBN 9781121062443 (2010). Our major course objective is to analyze legal regulation of the employment relationship. Although we will focus on illegal discrimination in employment, we also will cover other important employment law topics. You also will have the opportunity to sharpen your research and writing skills through essay examinations and writing assignments. Specific learning objectives are listed by chapter in the course textbook. These objectives highlight the critical body of knowledge you should master for each chapter and for the examinations. The general rule used in universities is that two or three hours of study are needed for each hour of class time. For this course, as we meet 10 hours a week, at least20 hours a week of course preparation will be needed. I am available for questions through telephone calls to the above-listed numbers, or through email messages. I draw examination questions from items posted to my website andthe following text coverage. I post class information on my website, as well as chapter handouts, PowerPoint slides and other materials. You will be responsible for leading class discussion on selected points, and for being prepared to participate. In addition, short papers will be assigned. Details for this area will come later in class. The examinations will be essay format. Your essay answers will be graded chiefly on content. I will grade anywriting assignments on both content and writing effectiveness. All terms in this course outline are subject to change.